South Tyrol’s Vinschgau Valley (Val Venosta in Italian) is certainly an area of contrasts. Each year, travellers flock to the region, but often for a wide variety of different reasons. For some, it’s the irresistible call of nature and that blissful sensation of escaping from it all; as the Vinschgau Valley has mountains, forests and tranquil natural scenery in abundance. For others, it’s the chance to get active; exploring the craggy, snow-peaked region on foot, by bike, or even on skis in the winter. The region also has a vast array of pretty apple and apricot orchards, an excellent national park, and some world-famous historic sites. Fans of a tipple or two will also appreciate the local wineries, which provide the perfect drink to conclude a day of exploration in the glorious natural surroundings. Vinschgau Valley has some really spectacular scenery, from dramatic mountain ranges to pretty alpine woodland and meadows. Stelvio National Park, one of the largest, not to mention most historic parks in the area, boasts breath-taking mountain scenery, glaciers and several varieties of rare plants and animals, making it a popular location for walkers, and Lake Reschen (Reschensee in German) is also another must-see location. The lake is beautiful in its own right, surrounded by fertile meadows and sun-soaked, tree-clad hills, but the principal draw is the dramatic sight of the submerged 14th century bell tower in the middle of the water. If you visit in winter when the lake is frozen, it’s possible to walk across to it. The Zimtal Lakes offer scenic walking opportunities and there are many irrigation channel paths running through the region, offering easy-going trails along the rivers and through the gently rolling countryside. For more challenging walks, head to the Mt. Ortler region (3,905m / 12,812ft) which offers great views of the surrounding landscape. If the weather isn’t ideal, or if you need a day to recover after your walk, you’ll be pleased to know that there are plenty of things to do in Vinschgau Valley. If you are keen on finding out more about the history of mountaineering then head to Castel Juval, the summer residence of the famous mountaineer, Rheinhold Messner. Originally built in the 13th century, it now houses the Messner Mountain Museum, Juval; which provides fascinating information on some things mountaineering related. The Vinschgau Valley Museum provides interesting information about the ancient irrigation canals in the region, with additional exhibitions about the agriculture and architecture of the valley, or alternatively, spend the afternoon sampling some of the fine South Tyrolean cuisine, including the excellent local wines. Visitors to Stelvio National Park may be able to see wildlife such as red deer, pine martens, chamois and marmots. Protected bird species include the Golden Eagle, Eagle Owl and the Black Woodpecker, and lucky visitors may even be able to spot the Alpine Salamander. There is also an impressive variety of plants and flowers in the region, such as typical alpine plants such as Edelweiss, Nigritella and Alpine Toadflax. In the lower regions Vinschgau Valley has a typically Mediterranean climate, with warm temperatures in the summer months (from 25˚ C to 30˚ C on average) and Spring and Autumn temperatures ranging between 15˚ C to 25˚ C. As a result, it’s possible to go hiking in comfort from March right through to October, although July and August tend to be the most popular. There are two international airports in the near vicinity, Innsbruck and Verona; both are within two hours drive of Vinschgau Valley. There is also a domestic airport at Bolzano. 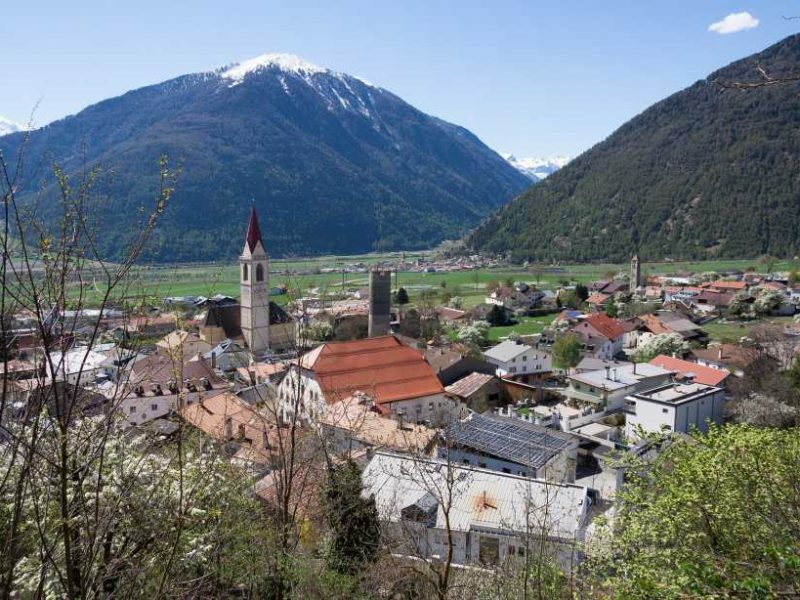 The area is well served by train and bus services, or alternatively, if travelling by car, Vinschgau Valley is well signposted and easy to access.